This 60ft Loa Luxury Sportfish Custom out of Golfito in the South Pacific was built by Mikelson Yachts of San Diego especially for extended long-range Pacific Ocean trips. Experienced bilingual captain Edgar Montero, who held the IGFA record for most Marlin caught in a year, is at the helm, assisted by two mates. 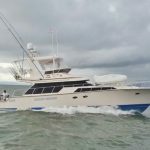 The boat is powered by twin Cummins diesel mains and gens, and has a huge live well, tuna tubes, modern Furuno electronics, satellite phone, on-board tender, walk-around decks, and a complete range of conventional heavy and light international tournament-class tackle, plus fly fishing gear. She has full A/C, a full galley, two freezers, two private staterooms with ensuite heads and hot water showers, a bunk room, plus separate crew quarters for three on the upper deck. Anglers board the boat in the late afternoon or evening, set out for the FADs at 10-11 PM, fish the next two or three full days, and are back in Golfito by midnight on the final day (they can spend that night on the boat).